A series of fliers have been developed to help tell the Baldrige story in real measurable results. This flyer describes the Baldrige Framework, Baldrige Critera and describes why an organization should use the framework and how they can get started. This flyer describes the core measures, clinical outcomes and process measures several healthcare organizations have achieved and how healthcare organizations can get started with Baldrige. 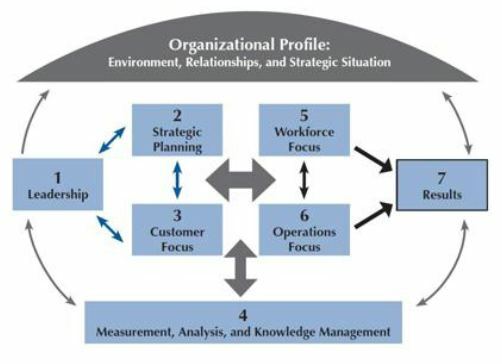 This flyer describes the profitability & growth, customer loyalty and engaged workforce of several manufacturing companies and how manufacturers can get started with Baldrige. This flyer provides two case studies that demonstrate results of a city government agency and a non-profit publishing house and how government and non-profit organizations can get started with Baldrige. Two case studies are presented in this flyer and describe the results of a restaurant and pipeline developer. And, how a small business can get started with Baldrige. Case studies describe small and large school districts that improved their student learning and other results with the Education Criteria. For more information about the Baldrige Criteria visit the Baldrige Resource Library! This entry was posted in Baldrige. Bookmark the permalink.